In 1996, a best-selling book titled Under the Tuscan Sun, which recounted how the author restored an abandoned villa in Tuscany, established that area of Italy as a popular vacation destination for Americans. Umbria, Tuscany’s next door neighbor, hasn’t been so glorified. Yet that often-overlooked region encompasses scenic, artistic and other treasures that reward those who seek them out. 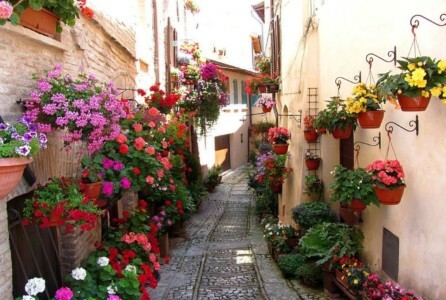 For starters, Umbria — pronounced Oom-bria by those who live there — boasts a setting of magnificent landscapes. The jagged Apennine Mountains lead to rolling hillsides that flatten into lush valleys blanketed by wild flowers. A number of hills are capped by villages of stone buildings and winding cobblestone streets that have looked over the setting for centuries. These ancient enclaves share similarities, including a central square and churches adorned with architectural touches outside and art treasures within. However, there are enticing differences and each has its own unique claims to fame. 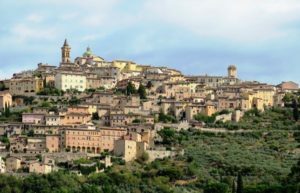 The two best-known towns are Assisi and Spoleto, and for very different reasons. St. Francis, who was born in Assisi in 1182, went on to found several religious orders. His birthplace retains much of its medieval character and the town’s basilica houses frescoes that depict chapters of his life and are among the most important works of art in Italy. Spoleto tells another story. Each summer, its jumble of narrow medieval streets is overwhelmed by people during the annual Festival of Two Worlds, this year from June 30 to July 16. This multi-faceted cultural buffet includes opera and jazz, ballet and modern dance, theater, visual arts and more. Other, less well-known, villages also have attractions that warrant a look-see. The approach to Orvieto alone is worth a visit. It rises up from the almost vertical faces of volcanic cliffs, and the ornate façade of its 13th century cathedral is one of the most elaborate in the country. Perugia, the capital of Umbria, has its feet firmly planted over a span of centuries. It’s home to several institutions of higher learning, including the University of Perugia, which was founded in 1308. It also hosts a number of annual festivals and other events. One of my favorite places turned out to be a tiny enclave hidden at the end of a gravel road. Poreta was a 13th-century village of a few dozen dwellings surrounding a modest sized castle. The fortress was abandoned after an earthquake damaged it and the houses that were huddled nearby. The townspeople built new homes, using stones from their destroyed properties. The brooding castle ruins still look out over a valley — as they have for centuries. About 150 people live in the reconstructed houses whose walls crowd the narrow lane so tightly that only one car at a time is able to pass. This nondescript hamlet transported me back in time and atmosphere at least as much as soaring cathedrals and bustling village squares. While petite Poreta is frozen in time, most of Umbria reveals intriguing tangible evidence of Etruscan, Roman and Medieval influences — often in the same locale. The Etruscan civilization lasted from about the 8th century BC until its assimilation into the Roman Republic beginning in the 4th century BC. Major evidence of Etruscan influence is found in Orvieto and Perugia. In Todi, walls construed during Etruscan, Roman and medieval eras still are visible. Spoleto offers a treasure trove of Roman reminders, including a house with a mosaic pavement and a restored first-century amphitheatre. Remnants of one of the largest amphitheatres built by the Romans stand just outside of Gubbio. 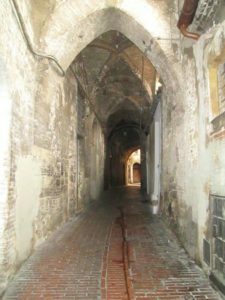 A memorable medieval setting is encountered in Trevi, whose ancient center of alleyways, porticos and vaulted passages is partly surrounded by the original 13th-century walls. Its hilltop position offers commanding views over the surrounding plains and groves of trees that surround the village yield some of the country’s best olive oil. Because Umbria is part of Italy, it’s no surprise that the region has a well deserved culinary reputation. That’s why it’s referred to as Italy’s cuore verde (“green heart”). Food typically is hearty country cuisine simply prepared to enhance the flavors of its ingredients. Meat and pastas are staples. Prized locally grown truffles, more of the black than white variety, are added to a variety of dishes. Montefalco wine, my favorite, is named for the delightful hill town which is surrounded by vineyards. 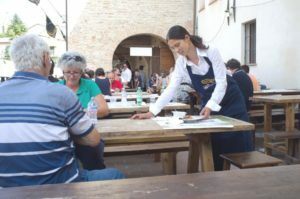 The hard-to-resist temptations of the table add to the sensory onslaught which envelops visitors to Umbria, and are part — but just a part — of what makes a visit there as memorable as it is enjoyable. 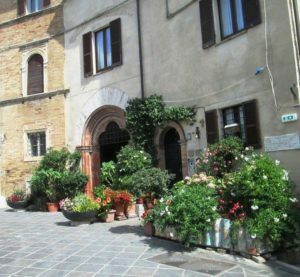 I received an avalanche of pre-trip material that helped me to, as the company promises, “live like the locals.” Along with basic details, it included insider tips about everything from Umbrian culture and good restaurants to food shopping and recipes. The fact that I was put up in a comfortable furnished apartment at a farm added to the feeling of immersion in the setting. If you go: For more information call 888-868-6871 or log onto untours.com. 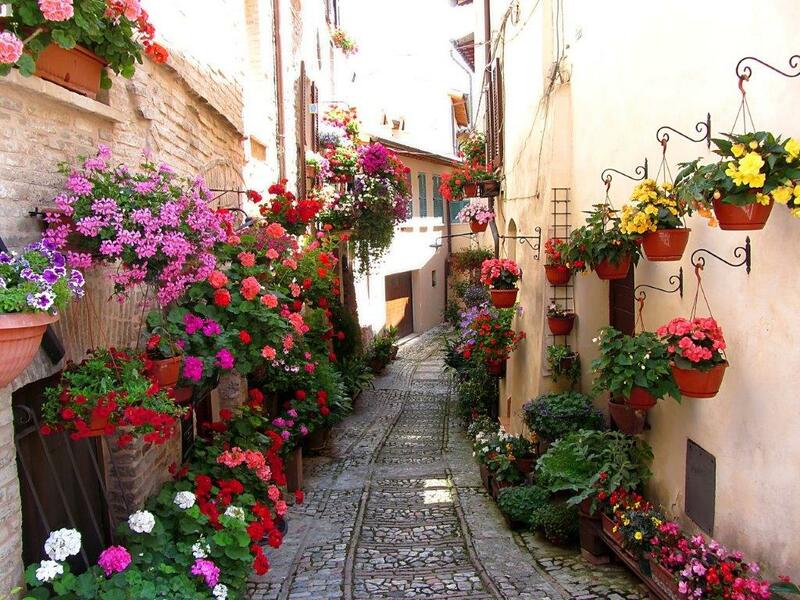 For information about Umbria, log onto umbriatourism.it.